Right when MH1 ‘LiveSound’ was first announced over a year ago by Sony Ericsson (*now ‘Sony Mobile’, after Ericsson sold its share of the company to Sony early this year), I wasn’t really paying much attention to it – Why wouldn’t I, or any audiophiles in that matter? After all, it is just a “headset” by the company’s smartphone division in Eupore, not from the famed headphone team in their Japan HQ. The bias kicked in and soon I have forgotten all about it. Fast forward to a couple of months ago, I was offered a chance to review the recently released Sony Bluetooth headset for Android, the MW1 ‘Smart Wireless Headset pro’, and find myself very impressed by the sound quality of - not only the BT unit itself, but also the IEM it bundled with. It turns out to be the shorten version of MH1 adapted for the BT headset. I immediately know it is an IEM that deserved to be reviewed as a standalone product before I can review the MW1. It will help to complete the story of MW1, and really give credit to the EU team that developed the excellent sounding headset. Sony Ericsson MH1 in bulk packaging from DX. Normally I’ll start by talking about the packaging in this section of the review, but since I didn’t receive the full retail packaging, I thought we will skip that part. Accessories wise, you will get a shirt clip and 4 pairs of silicone single flange eartips (S, 2xM, L). 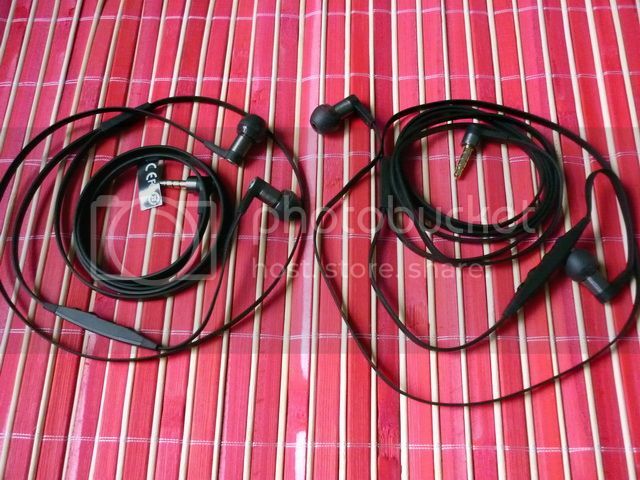 The IEM comes with 4mm wide flat cable in asymmetrical length (J-cord), and the Y-splitter is made in such way that cable must be looped behind the neck. 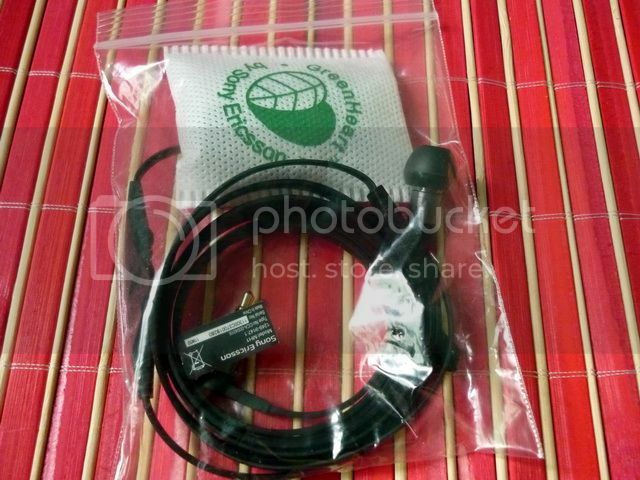 While the cable itself is indeed durable and tangle-free as advertised, it is also a bit cumbersome and microphonics – good thing that the shirt clip helps to manage the issue to an acceptable level, but they are not completely gone. 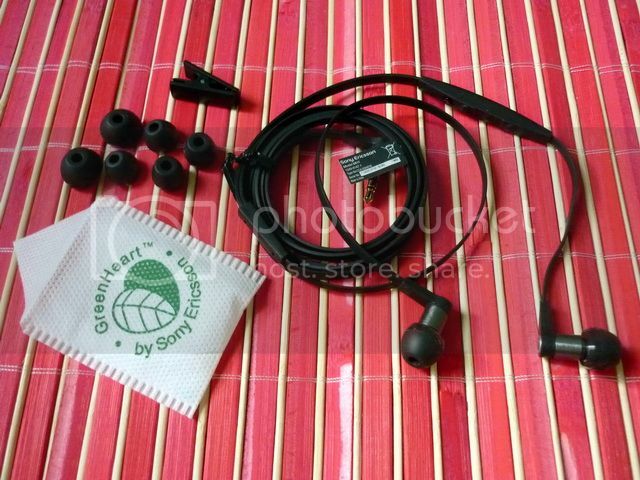 It would have been much better if it uses the smaller and oval flat cable found on Sony’s own XBA series of IEM. The cable is basically the only real complaint I have against the MH1, otherwise I would have been absolutely happy with it. The included eartips are an improved version of Sony’s own Hybrid style silicone eartips that first appeared on EX700 and still used on the latest XBA series. The bore is just a tiny bit wider which results in lesser hinder on sound transmission while the flange has been extended for a more secured fit. Like the original Hybrid, these should have been sold separately as accessories as well, but unfortunately they are not. Just 3 inches (or 75mm) underneath the left earpiece is the remote and mic. It has volume control as well as play/pause button (or to receive and hang up call) that should work with most of the current Android smartphone and tablet (*see next section for more detail). There is also an extra ‘smart’ button for assigning extra function, but unfortunately it only works with Sony own Xperia series of smartphone. Bear with me here in this section as it is quite important if you are interested in getting a MH1. Let’s begin by explaining two standards used in making the 3.5mm TRRS plug on headset – OMTP and CTIA (both are organizations for mobile standards). For OMTP, the TRRS plug is wired as [Left-Right-Mic-Ground] (from tip-to-sleeve); for CTIA, the TRRS is wired as [Left-Right-Ground-Mic]. Since OMTP was initially endorsed by Ericsson (and Nokia, which still uses the OMTP standard), all of their cellphone, including those under the Sony Ericsson branding, uses this standard. It also got adopted by a few other cellphone manufacturers as standard before mid 2011, such as LG, Motorola, Sony and Samsung. In mid 2010, the OMTP organization transitioned itself into another organization (the WAC, if you are interest to know), and the OMTP standard for headset was subsequently being phased out by most manufacturers within the following year (* it takes time to sell off old models) in favor of the CTIA standard. Part of the big reason for adapting the CTIA standard might be due to the fact that it is the standard used by Apple on their iDevice, which represent a big share of the headset market. Standardization demands from political groups (i.e. the EU) also played a role to push for one headset standard that will work on both Android and iOS, as well as most dumbphones (except for Nokia, which doesn’t like to play with other for now). Now that we have learned about the two standards, let talks more specifically in MH1. When MH1 was first announced, it was named ‘LiveSound’ under the Sony Ericsson brand and complied with the old OMTP standard. But when Sony bought out Ericssion’s share of the company and began to introduce their own Sony Xperia brand of Android smarphone, they start to adapt the CTIA standard on all their headsets. The new MH1 (*referred as MH1C, ’C’ is short for ‘CTIA’ presumably) is then renamed as ‘Smart Headset’ to differentiate itself from the old ‘LiveSound’ version. It was supposed to be a fairly easy and clean transition, but unfortunately it isn’t. Some of the new MH1(C) with CTIA wiring is still being sold on various part of the world under the ‘LiveSound’ moniker while other parts of the world already use the new ‘Smart Headset’ moniker. One thing for sure, if you see a MH1 with an old Sony Ericsson logo on the side, it is the OMTP version and not compatible to the newer Android smartphone. If it only has Sony logo stamped on the side, and being referred as ‘smart headset’ or with model name MH1C, then likely it is the new CTIA version. However, the only sure-fire way is to check with the seller for compatibility. In the event that you have acquired the wrong version for your cellphone, don’t despair – an inexpensive TRRS smart adapter will allow OTMP headset to work on a CTIA cellphone (and vice versa). This is by far one of the smallest I have found, and has pretty good build quality: here. MH1 and MH1C is close to identical on the outside. Last few notes on this topic: (1) CTIA plug is compatible to almost all typical 3.5mm TRS socket, meaning you should be able to use the headset as typical IEM on any mp3 player (i.e. iPod, Cowon, Sansa Clip, etc). OMTP plug on the other is not compatible to most 3.5mm TRS socket and only sound normal with the TRRS smart adapter mentioned before or when you pressed the call button on the remote. (2) Given Apple iDevice also use the CTIA standard, you can use the MH1C on any iDevices as well, but the volume control and smart button won’t work. Only the call button is functional. [UPDATE 30th Oct. 2012] I just got my Nano 7G and can confirm the mic won't work on it. Given I have tested the mic on my Nano 4G and it works, the current conclusion is - MH1 will likely work only on older iDevices but not the latest generation. Apple must have changed something along the way...[UPDATE again] As I was playing around all the different headset I have to figure out just which headset works with Nano 7G (and possibly iPhone 5) and which isn't, I stumble upon a solution to let MH1's mic and call button to work with Nano 7G and it is quite simple - it seems what Apple has done in the recent generation of iDevice is they have changed the resistance inside the remote that needs to trigger the mic and call button function, thus making some headset work while other won't. So how do we trigger the mic and call button function on MH1 (and likely on other headset that current don't work with the latest iDevice)? Easy, just press either Volume+ or Volume- button when you plug the headset in and release it when plugged in. The volume control still won't work, but it will give you the ability to answer call and play/pause music (single press), skip to next song (double press), back to previous song (triple press), voice over (long hold) and voice memo recording. 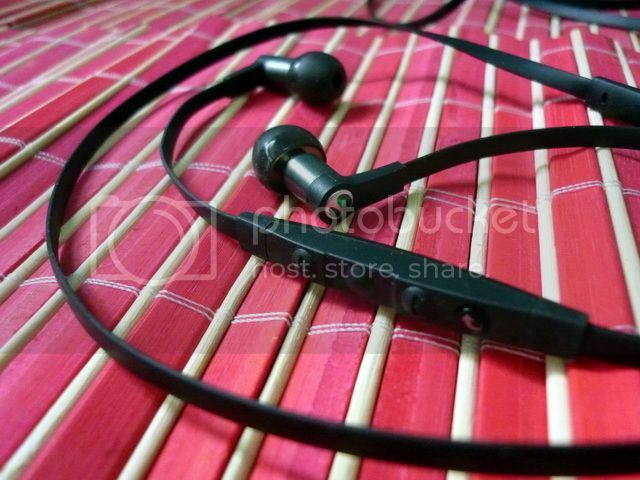 Just for fun, I ordered a pair of MH1C from DealExtreme and see if it is legitimate or not (*I also have the real MH1C sample directly from Sony). It turns out to be the real deal and it is the newer CTIA version as well. From the lack of packaging however, I’ll say they were probably taken from a full retail Xperia smartphone package (*some of the higher end Xperia smartphone come with MH1 as stock) and sold as a standalone product. Still, given I only paid less than $30 for a pair (retail is around $80), I’ll say it is well worth it. However, do note that even though I have received a real MH1C, it doesn’t mean you will too. Similarly, you can find a lot of ‘bulk’ deal of MH1 / MH1C on eBay, which may or may not be the real stuff. So buy it at your own risk. The IEM was given over 50 hours of burn-in before the review. At first, the bass can be a bit boomy while the presentation is more upfront than it should. In time, bass will settle down and the sense of space will improve. I do recommend a minimum 50 hours of burn-in (100 hours if you can) with MH1, but it is not mandatory. The IEM will sound good out-of-the-box - burn-in just tightens up the overall presentation and resolution. The overall sound signature of MH1 is warm and sweet, while well balanced in all frequencies. Bass extends down to 10Hz and hits with really good quantity and quality. Not the fastest or biggest impact around, but nothing to be ashamed of even among bass monster. Mid is sweet and right in the butter zone to give the right balance of intimacy and texture while still maintains a good sense of layer and space. Treble extends up to the very top, but it is more about smoothness than it is brightness. While analytical listeners might not find the sparkle or crispiness to be enough for their taste, it still however compliments the mid and bass impeccably and doesn’t feel lacking in anyway. Soundstage is rather good. By no mean the best of the best or endlessly large, it does portrait width and depth in a very 3D, well layered and resolving manner within its own confine. What I have noticed as I listened to MH1 during the course of evaluation is that this is an IEM that truly has bare minimum weakness in overall tuning. In fact, it excels in almost any genre I can throw at it – Pop, Alternative Rock, Vocal, Folk, Country, and even Classical – just name it. Granted it might not be the best at every genre, I will say it has some of the most consistent performance across the board… Okay, may be Electronic can use a bit more sparkles, but that’s about it - and it is not to say Electronic isn’t enjoyable on MH1 at all. As I have mentioned before, the only complain I have with MH1 is its cable. I just wish that it was less awkward, which would have made the IEM a smashing success. Beyond that, it is a fully capable IEM that can actually compete easily with IEM that cost 3 times its original price, right at the edge of top-tier category. Even Sony’s own XBA-4 is not that far ahead of MH1. If you are like me, please put aside your bias against headset and give this a try. If you can get a real MH1 with those $30 bulk deals, it would be an absolute steal – much like the craze over ADDIEM (Apple dual driver IEM) a few years ago, except this is much better sounding and an even bigger bang for the bucks. I’ll wholeheartedly recommend it with a Sonic Diamond [4.95 / 5]. *A big thanks to Sony Mobile for the MH1C sample. Check out The List for numeric rating. Important: All postings are my own personal opinion only and should not be treated as absolute truth. I do get things wrong just like everyone else. Always do your own research! To Amp, or Not to Amp? Check out "The List" for some old IEM ranking as well as sound signature. 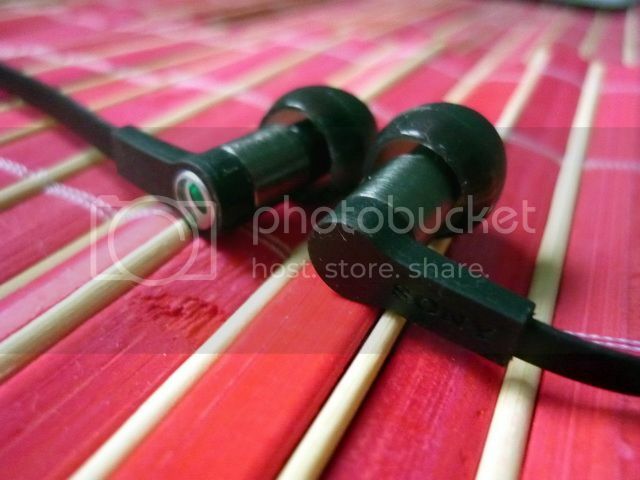 Interested in earbuds listing? 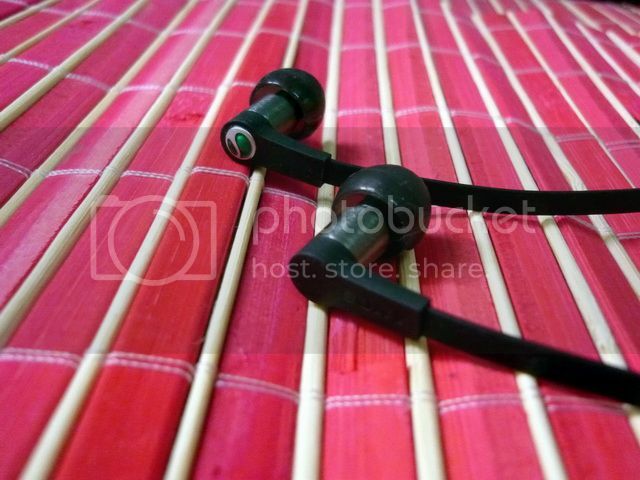 Check out my Earbuds Roundup page. Interested in portable amp? Check out my Sub-$100 and Sub-$200 Amps Shootout. Half human, half Tachikoma, full time audiophile with a side hobby of collectin earphones and writing audio gear review. Please reach me via the Contact Page. You can also find me over at Head-fi.org forum as 'ClieOS', though I'll be less active there. Check out my gears here. Want to help the site grows and see more reviews?